Last year the base Porsche 911 debuted with what was, to Porsche purists, a menace. To everyone else, it was a turbocharger on a Porsche 911 that was not labeled “turbo.” It turns out the world didn’t end, and now the next half-step up in the 911 line, the Porsche 911 Carrera GTS, is getting one too. “Sacrilege!” cry Porsche fans, because that’s all they’ve been doing really ever since Porsche first introduced the front-engined Porsche 924 in 1976, and then a Porsche 911 Turbo that didn’t try to kill you with the 993, and then a water-cooled 911, and then the Boxster, and then the Porsche Cayenne, and an infinite number of perceived insults and slights in between. The latest insult and/or slight was when Porsche slapped a turbo onto a car not named a capital-T Turbo, in a concession to constantly evolving emissions regulations, and everyone cried out. Until they stopped crying, because the current Porsche 911, the 991.2, is actually a very good car. Really. Try one. The latest to get the turbo treatment is the Carrera GTS, which is sort of a in-between model for those who think a Porsche 911 Carrera S is too slow, but a capital-T Turbo is just slightly too rich for anyone’s blood. And also, they want rear-wheel drive. But! That doesn’t mean you can’t have a 911 GTS in all-wheel-drive. Because this is Porsche, and of course you can, as you can really get whatever the hell you want as long as it’s not a rear-drive Turbo. 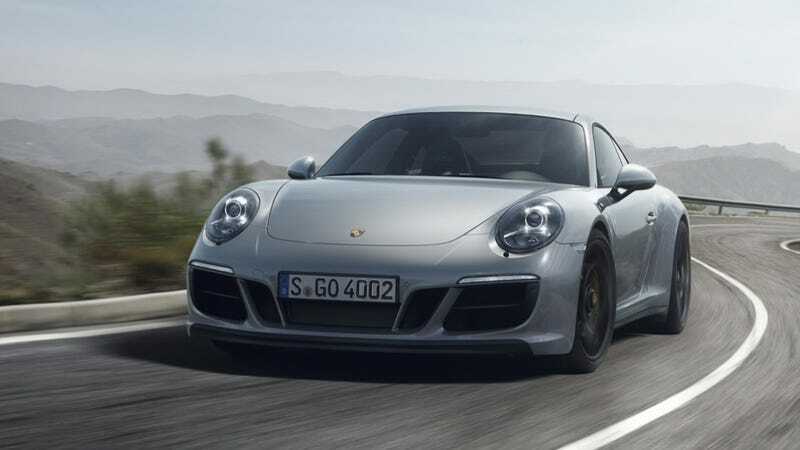 In this case, the GTS makes 450 horsepower and 405 foot-pounds of torque, and like the regular 991 GTS that came before it, it’s sure to be plenty good, though this time it’s got 20 more horses. Porsche claims it’ll be good for zero to 60 MPH in 3.6 seconds if you get all-wheel-drive and Porsche’s dual-clutch transmission, known as a PDK, and I’ll bet that’s right on the money. And because it’s a Porsche 911, and all Porsche 911s are now luxury cars and have been for some time now, it’ll all be very luxurious inside, with the Sport Chrono package coming standard and everything. Leather on the air vents, an aesthetic choice fit only for butchers and serial killers, is an option. One I would, of course, take. Beyond your standard Carrera GTS, you also get the choice of a Carrera 4 GTS, a Carrera GTS convertible, a Carrera 4 GTS convertible, and a Targa 4 GTS. Porsche fans are like goddamned Goldilocks, demanding every little tiniest most annoying permutation of the vaunted Porsche 911 they can get. And that’s the way we like it. I implore you buy one at your earliest convenience.